Solomon spoke along these lines when he spoke of there being a time and a place for everything. It is interesting that he said there was even a time to kill, even though one of the Ten Commandments says thou shall not kill. Normally it’s considered good to create and build things up but he says there’s also a time to break things down. In other words, that which is evil in one situation can be good and another situation. 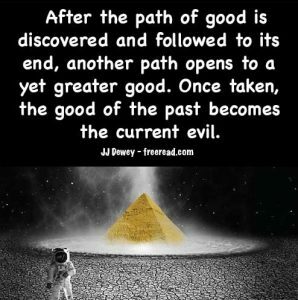 Good and evil is also dependent on our consciousness. In the consciousness of the Mormon it’s not good to drink a cup of tea for it goes against the word of the prophet but in the consciousness of the typical English person who ignores the prophet it is very good. The basic thought behind the quote is this. As society evolves, consciousness evolves and values change, generally for the better. For instance in Old Testament times it was seen to be a good thing to put gays to death, but most of the civilized world has evolved to the point where they see this was a wrongheaded idea. That which is seen as good at one time is not always good at another time as we evolve into greater light. We can also see this principle at work in the general evolution of civilization. We started out in ancient times with tribal living and that was seen as good because it provided a way for people to gather together and survive. Then we transitioned into kingdoms ruled by strong central authority such as a king. It was then seen as evil to remain in tribes and not be subject to the central authority. Then after democracies begin to develop a strong central authority was seen as tyranny or evil rather than good. That which was seen as good changed to honoring the will of the people. One might say, well let’s take love, for example, it’s always good to love right? But people do not realize how love was understood before Jesus. Love was seen by the masses as a selfish thing. You love your children, your spouse, your friends but you don’t love your enemies. Jesus presented a new concept of love that brought people to higher level. Loving your neighbor as yourself even if your neighbor was of a different race or nation or people expanding their thinking. In Old Testament times people generally just loved those things that were beneficial to self. Love was associated with that which fulfilled selfish desire. So reverting to the old idea of love before the time of Christ would be a negative thing and the good was to accept new ideas about it that would take us to a higher level. Inspired teachers of the past were limited in what they could present to the people. Moses could not present the higher law to the people because they were not ready, plain and simple. So the highest good back then were black-and-white commandments that allowed little room for judgment. Then after the time of Christ when we realized that “the letter of the law killeth and the Spirit bringeth life” it dawned on the consciousness of many that reverting to the letter the law over the Spirit was the new evil and the new good was to receive the Holy Spirit and follow its guidance. A question someone might ask here is whether there are certain things that are good that would always be good. As far as law goes there are always exceptions. We are told to not steal yet if your kid was starving to death and you had to steal a loaf of bread from a rich man to save his life it would be the greater good to take that loaf of bread. The one thing that is always good is to find the next step you have to take as you progress through life and verify it through the Holy Spirit within you and then take it. That is one thing you can depend on being good always. It was good or thousand years good, and it’s still a good idea today.